At Medical Audits we know how difficult it can be to get the time to prepare education sessions for all the different types of staff groups. We also know that if you can design your training to the specific needs of the group you are educating and provide them with relevant examples, it makes learning easier. We have prepared sessions for you to down load and use for numerous different staff groups and covering numerous topics such as standard precautions, hand hygiene, basic induction training, management of infection prevention during building works and many more. Using this same concept, audit, training and education can be carried out in a consistent, logical manner. 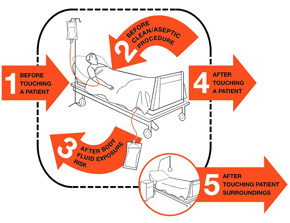 Hand hygiene audits promote clean care.